From the seductive natural beauty of The Caves Hotel carved out of Jamaica’s seaside limestone cliffs to the wellness retreat of Saint Lucia's The Body Holiday, the Caribbean is filled with sumptuous all-inclusive resort getaways. Some welcome children with enticing amenities like waterparks and teen discos. 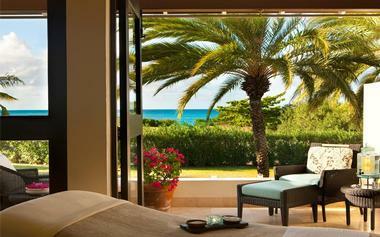 Others cater to adults only, with secluded villas and tranquil spas. Ladera Resort is the only all-inclusive resort located on a UNESCO World Heritage Site, situated along the west coast of St. Lucia in the town of Soufriere. Once a part of the Rabot Estate, the most famous and oldest cocoa plantation, this resort offers guests a breathtaking setting nestled on a volcanic ridgeline 1,000 feet above the tranquil blue waters of the Caribbean Sea. It boasts an intimate and romantic atmosphere with just under 40 suites created from locally selected tropical hardwoods and furnishings made by local artisans. They offer a wealth of amenities, including an infinity pool overlooking the majestic Pitons, a soothing spa, and award-winning cuisine at Dasheene. Beaches Turks & Caicos Resort Villages & Spa is a beautifully unique and exciting vacation destination showcasing the architecture and atmosphere of France, Italy, Key West, and the Caribbean. This 45,000-square-foot waterpark featuring five striking villages and spanning 12 miles of clear turquoise water and white sand beaches has a little something for the whole family. An energetic teen disco, the enormous Pirates Island Waterpark, an Xbox play lounge, and fun-loving Sesame Street characters are just a few of the highlights for teenagers, tweens, and tots. The adults in the group will enjoy the six pools (three of which feature swim-up bars), romantic fine dining restaurants, the Red Lane Spa, scuba diving, and snorkeling. Cap Maison Resort & Spa is an opulently designed luxury hotel situated adjacent to the St. Lucia Golf & Country Club and near the upscale Rodney Bay area, making it one of the most sought-after locales on the island. Here, intimate and chicly designed villa suites make it feel as though visitors are in a private residence, while still providing exceptional hotel facilities. These incredible amenities include two of the finest restaurants on the island – The Naked Fisherman and Cliff at Cap. They also boast several impressive public and private pools, offer various watersport opportunities such as snorkeling, provide premier golfing right next door, and host entertainment by Saint Lucian locals every night. 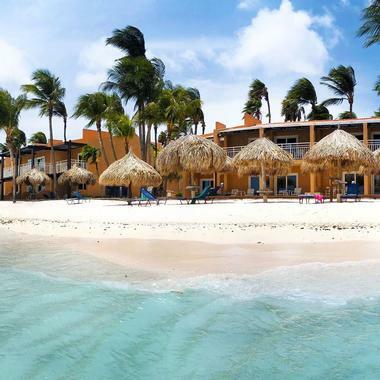 Divi Aruba is a luxurious all-inclusive Aruba resort that overlooks the pristine Divi Beach in Oranjestad, conveniently located near top area attractions such as Arashi Beach and the preserved 18th-century Dutch Fort Zoutman. All guest meals are included with all stays, including unlimited alcoholic beverages at all bars throughout the resort. Diners can choose from a wide variety of international dining options, ranging from Asian fusion cuisine to Argentinian grills, with additional fine dining restaurants available for an all-inclusive upcharge. Guest rooms and suites feature colorful decor accents and top amenities such as flat screen televisions and private patios or balconies, with whirlpool tubs and private living rooms offered in suites. All guests can take advantage of outdoor recreation opportunities during their stay, including snorkeling and windsurfing courses. 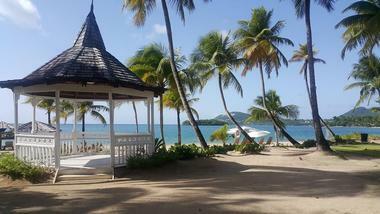 Curtain Bluff Resort sits on a peninsula between two incredibly magnificent beaches. On one side, the water is calm and tranquil, making it ideal for swimming and water sports; the other side is washed by ocean surf. Each of their 72 guest rooms and suites features exceptional seascape views of Surf Beach and nearby bluffs. The resort has two restaurants, the Tamarind Tree for breakfast and dinner and The Sea Grape for a casual, barefoot lunch. Onsite facilities include a fully equipped watersports center, a squash court, a championship tennis center, a fitness center, a tranquil spa that overlooks the sea, a beach bar, and a beachside swimming pool. East Winds is one of St. Lucia’s best-kept secrets, offering visitors genuine Caribbean luxury. The 12-acre boutique resort features more than 100 species of trees, tropical plants, and colorful birds. 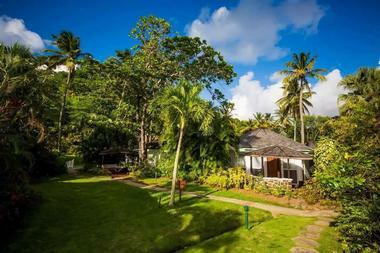 They have 30 cottage-style suites nestled within the gardens along their pristine secluded beach. 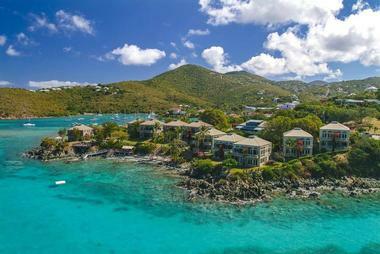 Visitors can enjoy an array of watersports in their tranquil turquoise waters, such as scuba diving and snorkeling. They also provide exclusive experiences that are included in the all-inclusive price, such as boat trips to the Pitons, rum tasting, yoga, Pilates, tours of the Morne Coubaril Estate, dolphin and whale watching, distillery tours, and sunset cruises. 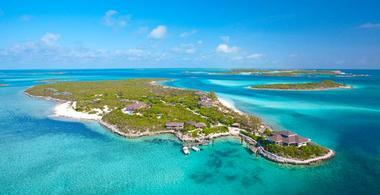 For a private island experience, the Fowl Cay Resort is the perfect destination. Spread across a secluded 50-acre oasis in the private chain of the Exumas, Bahamas, there are no other hotels, no crowds, and no passing ships. Six one-of-a-kind villas are situated on this island, offering visitors the chance to explore a unique wilderness surrounded by warm, tranquil, turquoise waters. Renting one of these six homes comes with premium alcohol, delicious meals, fully stocked kitchens, a personal golf cart, and a personal motor boat with unlimited gas as well as access to all games, equipment, and watersports provided on the island. Gallery Bay Resort & Spa is a boutique property situated across 40 acres of stunning, lush tropical gardens offering every guest a sense of privacy. 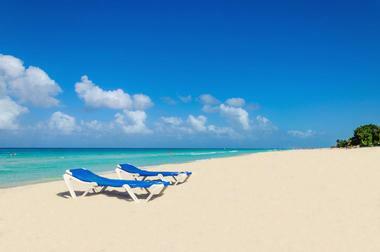 The focal point of the resort is the mile-long white-sand beach and crystal clear Caribbean water. Here, visitors can soak up the sun while enjoying a refreshing swim or recline against a giant palm for a break in the shade. The resort features 98 guest rooms and a collection of premier Gauguin Suites hidden among the gardens that have incredible views of the lagoon as well as private, secluded plunge pools. The resort also features three open-air restaurants, three lounge areas, live entertainment, a tennis court, a swimming pool, and complimentary watersports. 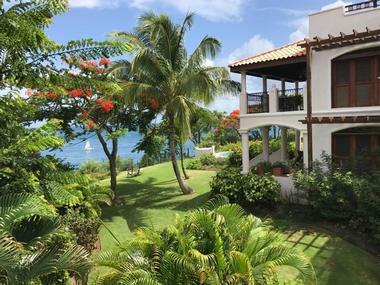 Gallows Point Resort is situated on a beautifully landscaped 5-acre peninsula in St. John, U.S. Virgin Islands, boasting panoramic, picturesque views from their private oceanfront location. Located a mere 5 minutes away from Cruz Bay by foot, guests will delight in this tropical oasis featuring newly renovated one-bedroom villas with ocean views. The resort has an exquisite fine-dining restaurant – Ocean 362 – as well as a gift & gourmet coffee shop, an open-air bar, an oceanfront pool and Jacuzzi, and complimentary yoga and Pilates classes. An array of activities can be set up by the expert concierge staff, such as helicopter rides, horseback excursions, and boat charters to other islands. 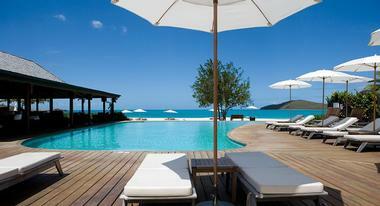 Hermitage Bay is a five-star boutique hotel located on Antigua’s west coast featuring 30 magnificently decorated suites. It sits on the hillside and beach of a beautiful, natural bay amid lush tropical gardens. Surrounding this tranquil retreat are 140 acres of verdant undeveloped land, providing visitors with a sense of seclusion. Guests can participate in an array of watersport activities such as sailing, fishing, and scuba diving as well as indulge in a helicopter or farm tour, play a round of golf, or visit some historic sites. The resort also provides an array of wellness activities such as cooking classes, organic treatments in the Garden Spa, and yoga, Pilates, and meditation classes. 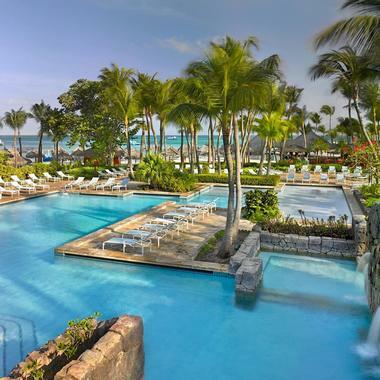 The Hyatt Regency Aruba Resort Spa and Casino is a luxurious and relaxing beachfront resort featuring sugar-white sand beaches and stunning crystal blue Caribbean waters. Guests can relax in their elegantly modern guestrooms or luxuriously designed suites with private balconies overlooking the pool, ocean, or lush garden. 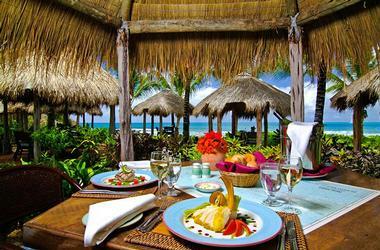 The resort boasts five restaurants and bars; three are upscale, while the other two are more casual establishments. They feature an 8,000-square-foot water complex, full-service spa, and a wealth of watersport activities from exhilarating banana boat and catamaran rides to underwater tours. Outside the resort visitors will find attractions such as museums, caves, historic gold mines, a bird sanctuary, and a butterfly farm. Iberostar Grand Hotel Bavaro is an elegant five-star adults-only hotel located in the storied Bavaro de Punta Cana Beach. This expansive complex features Greco Roman-style architecture with exceptional manicured gardens and breathtaking views of the aquamarine Caribbean Sea. There are three pools, two of which are lake pools. 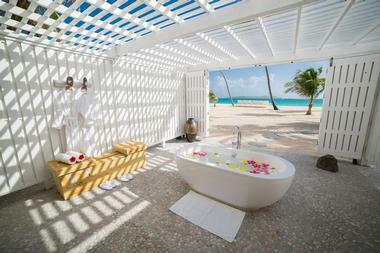 One is designed for activities, while the other boasts an aqua-bar as well as two open-air Jacuzzis. There is an onsite gym with regularly scheduled activities and classes such as archery, tai chi, spinning, and dance classes. The hotel also features the Iberostar Bavaro Golf Club with 18 premier holes, a spa and wellness center, four á la carte restaurants, five bars, one beachfront buffet, and one international buffet. Jade Mountain Resort is located on the southwestern side of the St. Lucian Caribbean shoreline, towering above the 600-acre beachfront sister resort, Anse Chastanet. It features a daring architectural design showcasing rugged stone-faced columns, singular bridges that lead to infinity pool sanctuaries, and magnificent platforms that appear to float out into nature. This organic oasis offers incredible cuisine, from James Beard award-winning Chef Allen Susser, to be enjoyed at one of their many beautifully designed spaces, such as the Celestial Terrace. They feature an extensive list of spa treatments from their boutique spa and fitness studio, and offer guests the use of their sister resort’s amenities and activities. 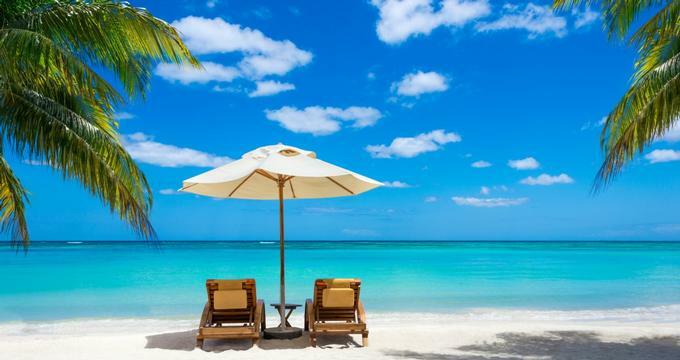 Jumby Bay is a Redwood Resort located on Long Island, a quaint peninsula 2 miles off Antigua’s northeast coast, featuring white powdery sands and calm turquoise waters. Pristine suites are available, but the Rondavel rooms are exceptional, with octagonal cottages boasting grand four-poster beds, wraparound terraces, and outdoor showers as well as private beach and pool access. The resort itself is equipped with three outdoor tennis courts, a full-service spa, three restaurants, four bars, two outdoor pools, a 24-hour business center, and a free children’s club. Outside the resort, there is an array of activities and attractions in which to partake, such as Prickly Pear Island, St. Peter’s Church, and Hell’s Gate Island. 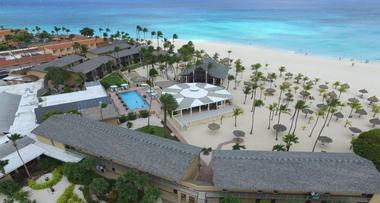 Manchebo Beach Resort & Spa is nestled along Aruba’s incredibly beautiful and serenely quiet Eagle Beach. An intimate oceanfront haven, it’s the ideal locale for wellness-conscious travelers who have an appreciation for charming island culture but also want contemporary amenities and services. Foodies are drawn to this resort thanks to their four distinct world-class restaurants serving everything from Aruban classics to Mediterranean delights; they even have a premier sushi bar. Health and wellness is a focal point here, with early morning yoga classes, invigorating fresh fruit smoothies, and island-inspired spa treatments. A variety of adrenaline-soaked adventures can be booked using the concierge services, from shipwreck diving to off-roading rugged hills. Palm Island Resort & Spa is located on the southern point of St. Vincent and the Grenadines, a wondrous collection of 32 tropical islands and cays offering visitors an unsurpassed natural beauty. They provide a private and secluded island feel as this 135-acre hideaway can only be accessed by boat. The resort itself features an array of restaurants and bars, from the fine-dining elegance of the Royal Palm Restaurant to the relaxed seaside Sunset Grill. Palm Island also features a tennis court, fitness center, and wellness spa as well as a collection of nature and cycling trails, watersport activities, and sea excursions. Rendezvous is an all-inclusive resort designed specifically for couples who only want to answer to the sun and the stars. 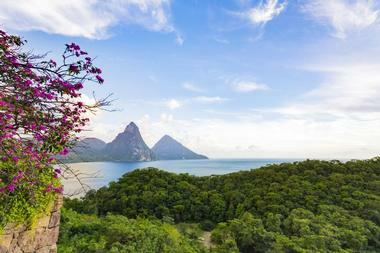 Located on the island of St. Lucia along the Caribbean Sea, this tranquil and secluded island is surrounded by exotic, tropical gardens and 2 miles of white sand beaches. There are seven restaurants and bars to choose from, and a rejuvenating spa surrounded by lush, tropical greenery. They offer several land and sea activities such as golfing and sailing, but their true highlight is the river-inspired pool. The river loops and meanders, beginning at the top end of the resort and creating small secluded islands and isolated pools along the way. Sandals Emerald Bay Resort is located deep within the picturesque waters of the Exumas, providing unparalleled luxury within the tranquil flow of the Out Islands of the Bahamas. Lying in a secluded enclave, the resort offers guests a sense of privacy while being treated to premier service and exceptional amenities. 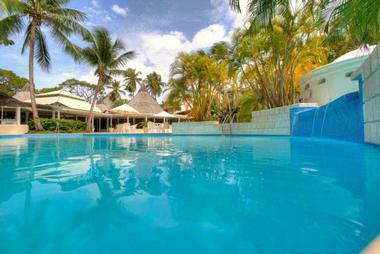 Situated within 500 acres of tropical beauty along a mile-long pristine beach. This Bahamian-style resort boasts four exceptional pools, including one with a beach entry design and a sensational fire pit at its center. Sandals Emerald Bay also offers seven world-class restaurants, bars, pubs, the Red Lane Spa, a state-of-the-art fitness center, a golf course, and tennis courts. Sandals Royal Plantation is located in Jamaica’s north coast in the town of Ocho Rios, featuring an understated elegance with their retro-chic design. This charming and intimate resort is nestled into a gorgeous coral bluff boasting 74 ocean front suites, each provided with their very own butler. Surrounded by manicured lawns, picturesque terraces, and roaming peacocks, guests can indulge in five exquisite dining opportunities including the country’s only champagne and caviar bar. Sandals has a main private beach, two private cove beaches, two full-service bars, two pools, the Red Lane Spa, and unlimited land and water sports including golf at nearby Sandals Golf & Country Club. 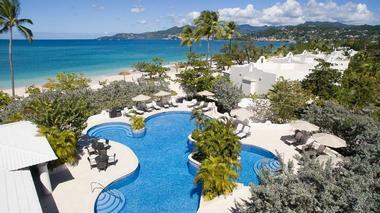 Spice Island Beach Resort is an AAA five-Diamond resort located on renowned Grand Anse Beach on the island of Grenada. Situated on 21 miles of Caribbean Sea coastline, the resort is surrounded by gorgeous tropical rainforests and beautiful coral reefs. 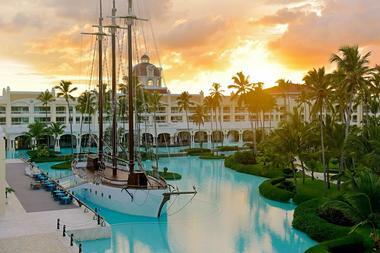 Its position just 12 degrees north of the equator offers guests sunny days enhanced by cooling trade winds. The resort provides two world-class restaurants with culinary offerings of international favorites and authentic local specialties. They also feature beautiful pools, a relaxing spa, and unlimited free access to various watersport amenities, from Hobie Cats to paddleboards. A highlight is their scuba diving experiences, where guests can explore unspoiled reefs, shallow coral gardens, and 15 shipwrecks. The Body Holiday resort is located in a secluded cove featuring a sugar-white sand beach along the Caribbean Sea in beautiful Saint Lucia. Surrounded by tropical rainforests and gardens, it is the idyllic locale for a wellness retreat to rejuvenate the mind, body, and soul. This renowned wellness center caters to the wishes of each traveler. Guests can experience as much or as little of their treatments and amenities as desired. Offerings include an indulgent array of body treatments, state-of-the art therapies, fitness activities, recreational sports, and exotic adventures. The Body Holiday features five-star restaurants utilizing locally sourced ingredients and food from their own onsite organic garden. The Caves Hotel is a natural preserve turned handcrafted oasis located in Negril, Jamaica. Nestled on the limestone cliffs of the city’s scenic West End, it offers the seductive beauty of an oceanfront sanctuary. The hotel perfectly blends its incredible natural surroundings with a contemporary, metropolitan atmosphere. The Caves boasts twelve extraordinary cliffside cottages overlooking 7 miles of tranquil white sand beaches, two dining gazebos, the iconic Blackwell Rum Bar, private caves, a spa, sauna, Jacuzzi, saltwater swimming pool, and private hot tub. Watersports are popular here due to the unique natural caves, where guests can venture out on snorkeling and scuba diving expeditions. Located on Barbados’s West Coast, The Club Barbados is a stunning oceanfront adults-only all-inclusive resort offering a variety of garden or ocean view rooms and suites. It features two premier restaurants, three bars (including a genuine Bajan rum shop), a relaxing spa & salon, three freshwater swimming pools, and a freshwater Jacuzzi. Watersport activities are popular here, providing everything from fishing and catamaran sailing excursions to windsurfing and kayaking experiences. The Club’s concierge services can also assist in planning a variety of off-site adventures like a rum and history tour, sunset cocktail cruise, or turtle feeding trip for those who want an authentic Bajan experience. 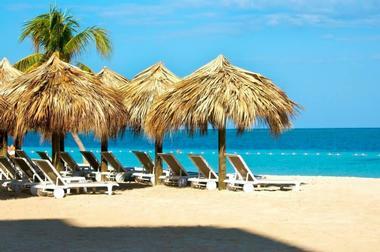 Iberostar Grand Hotel Rose Hall is situated in a private north shore enclave located bayside in beautiful Montego Bay. 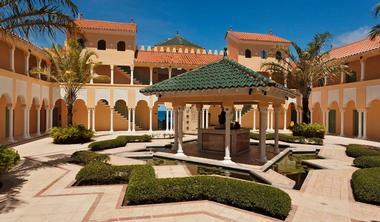 It boasts traditional colonial style, offering guests a European elegance in a funky, lively neighborhood. This palatial resort is an adults-only all-inclusive featuring an assortment of modern amenities and a variety of activities. The hotel resort offers five distinct specialty restaurants providing diverse culinary experiences such as Mediterranean, Italian, and Japanese fare as well as two buffets and six bars. Their SPA Sensations service menu is an absolute highlight with an array of spa treatments and hydrotherapy spaces such as thalassotherapy, pools, Jacuzzis, and Turkish and Roman baths. Situated on 19 acres of gorgeous beachfront property, Couples Tower Isle is a sun-soaked playground on its own private island. They offer a collection of recently renovated guestrooms and suites as well as eight additional exclusive Oasis Spa Villas, offering visitors unlimited spa treatments. The property features six exceptional restaurants, five bars, and four pools with Jacuzzis. There is a wealth of watersports to be enjoyed such as scuba diving, snorkeling, windsurfing, water-skiing, paddle-boarding, hydro-biking, and Hobie Cat sailing. The island itself also has a wealth of recreational activities like movie nights under the stars, piano sing-alongs, and complimentary tours to national treasures such as Dunn’s River Falls.